Take a good look at your sofa. If you don’t see any stains or debris, you likely assume it’s spotlessly clean – but don’t be so quick to sit down. There’s a strong possibility that your sofa is covered with germs and bacteria that could land you in the hospital. 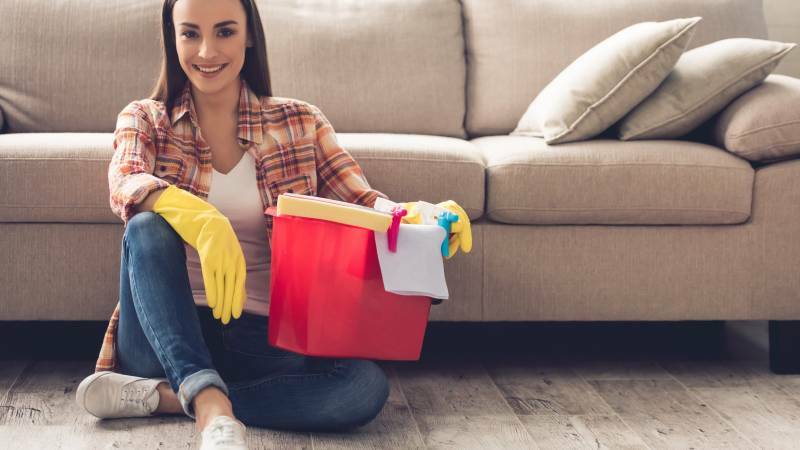 Though we often only make an effort to thoroughly clean our furniture if we see clear signs of dirt, there are a host of dirty secrets hiding in the fabric of your sofa. And if you fail to stop the harmful microorganisms underneath the surface from spreading throughout your home, it’s only a matter of time before you lose the impeccable indoor environment you enjoy. Even the best cleaning products can’t always tackle the microorganisms you need to eliminate. Here’s how you can fight the toughest invisible germs hiding in your furniture. As soon as you removed the protective plastic from your new furniture, it became exposed to dust, dust mites, and airborne debris. Mold spores and other allergens tend to attach themselves to upholstery as well. That’s why it’s highly advisable for you to disinfect your love seats and sofas even if they look great to the naked eye. Remember that appearances are often misleading. Pseudomonas: This bacterium mostly affects sick people, so have you visited the hospital lately? Once pseudomonas is in your home and on your furniture, everyone who comes into contact with it may develop a skin rash, an eye infection, a headache or a fever. People with a weakened immune system are likely to have a severe reaction. Staphylococcus aureus: Someone with staph bacteria can easily infect other people and objects, including linens, personal care items, and furniture. If you sit on a contaminated chair, you run the risk of developing pus-filled boils, painful rashes, and even life-threatening diseases. The location of the infection will determine your symptoms. Aspergillus versicolor: This fungus grows on carpets and furniture in moisture-rich indoor environments. If your ventilation system starts to circulate the fungal spores throughout your home, your family’s health will be in jeopardy. Fungus can cause respiratory symptoms and terrible allergic reactions. First-rate upholstered furniture is designed to retain its aesthetic appeal, so a superficial examination won’t suffice. If you want to be sure that your favorite sofa is free of debris and germs, spare no effort to give it a thorough cleaning. Out of all the methods available, the following are proven to get the job done effectively and efficiently. If your goal is to prevent germs and allergens from accumulating, don’t start cleaning at the end of the year. It’s in your best interest to use these methods after each season passes. The market is overflowing with products designed for upholstered furniture pieces. The right product to get is the one with an EPA registration number. This number is proof that the spray meets the required standards, so you can rest assured that it will deliver high-quality results if used correctly. Disinfectant sprays are able to eliminate nearly all of the germs that live on the surface, between the fibers, and in the seams. Steam cleaning isn’t just easy to do; it’s also worth your while because you can achieve flawless results in a timely fashion. The steam is powerful enough to deal with hardy germs and deeply embedded debris. Microorganisms just can’t withstand the hot temperatures. After each application, your upholstered furniture will look great and smell new again because this cleaning method also gets rid of stubborn stains and foul odors. When it comes to dirt management, vinegar is among the best solutions you can use. If you mix it with some olive oil and wipe your leather furniture, you’ll see why it’s a staple product for so many homeowners. Spray the mixture on to the leather, and use a white towel to clean every spot. You’ll have germ-free furniture for years to come if you get in the habit of using vinegar on a regular basis. If you’re interested in cleaning and eliminating germs on your furniture, start a search today.